This humble tool is the answer to lost drawstrings. The laid-back style, warmth, comfort and general wearability of a hoodie -- basically a sweatshirt with a hood -- make these familiar garments a favorite among people of all ages, from infants to busy students and active senior citizens. Durable and versatile, hoodies just get better and softer with time. Although most hoodies require little attention other than an occasional trip through the washer and dryer, hoodie drawstrings tend to annoyingly slide out of their proper place. If your hoodie string has lost its way, returning the string to its proper place is surprisingly simple. 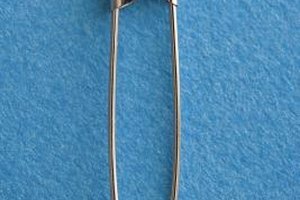 Attach a long, thin safety pin to one end of the string and then close the pin. Although you can use a small pin, a longer pin is faster and easier. Insert the pin with string attached into one side of the hoodie casing. Hold the casing with one hand while you nudge the pin through the casing, a little at a time, with your other hand. Remove the pin when you reach the other end of the casing. Pull on both ends of the drawstring until the string is even on both sides but be careful not to pull the string back through the casing. Tie a knot in each end of the string to help keep it from pulling out. Tie the strings together before laundering your hoodie to prevent them from pulling out. A few small, well-placed stitches keep hoodie strings securely in place. Be sure the string is even on both sides and then use thread and a needle to stitch through the casing and the string at the inside center of the hood. Do I Need to Tie a Sirloin Roast?